Now Foods Astragalus Extract is a specialist product containing the Astragalus root extract. Used for centuries in traditional Chinese medicine, Astragalus drew interest of scientists in the West, who have conducted numerous clinical studies and confirmed the safety of its usage and unique efficiency of the plant’s extract regarding many ailments, from the common ones like the flu or a cold, to more serious disorders of the circulatory system and the liver or cancers. However, the greatest benefit of using the supplement is its extraordinary potential in terms of regulating the immune system. Astragalus (Astragalus membranaceus, also called milkvetch) is a Chinese plant that has been used for ages in herbal medicine, mainly as a strengthening and regenerating agent. In its root were found many biologically active compounds, such as saponins (including the most-studied astragaloside IV), flavonoids, polysaccharides, triterpene glycosides, trace elements and amino acids. It is them that are responsible for Astralagus’ therapeutic properties. Through complex mechanisms, the compounds efficiently strengthen the organism, regulate its immunity, improve life quality and longevity. Astragalus is an adaptogen, which means it helps the organism to adapt to and tolerate hard conditions, such as heavy physical or intellectual effort, anxiety and stress. It is also safe for the organism, and it does not have any side effects when used according to recommendations. Active substances contained in Astragalus extracts activate the immune system in many ways. They affect nearly all elements of the system, strengthening and multiplying them. Clinical studies have proven that Astragalus increases the production of immunoglobulins (antibodies with a major role in protecting the organism from viruses, bacteria and parasites) and T lymphocytes (cells responsible for destroying cancer cells and those infected by microorganisms). It stimulates macrophages, that is cells that eliminate viruses, bacteria, fungi and fragments of damaged cells. It stimulates LAK cells (Lymphokine-Activated Killers), which play a major role in fighting cancer, and NK cells (Natural Killers), whose role is recognising and destroying malformed or infected cells. Astragalus also increases cytokine levels, that is chemical transmitters participating in immune responses. It makes the organism secrete more interferon as well, which is a protein produced and released by cells as a response to the presence of pathogens in the system. Strengthening and multiplying the population of the key elements of the immune system naturally stimulates the organism’s self-defence, improves the ability to destroy pathogens and efficiently prevents diseases. Clinical studies have confirmed that Astragalus extracts have cardioprotective properties. First of all, it is a strong antioxidant, so it can be helpful in treating various heart diseases, alleviating their symptoms and improving heart functions. Saponins present in Astragalus have the ability to inhibit lipid peroxidation in the cardiac muscle. It is a remarkably harmful process of lipid oxidation that leads to the formation of their peroxides, which trigger damaging chain reactions. Preventing the cycle protects the heart from damage caused by the activity of free lipid radicals. Astragalus increases the strength of heart contractions, improving circulation in the whole organism. Research has shown that astragaloside IV, isolated from its root and administered to patients with congestive heart failure and after a cardiac arrest, was able to alleviate pains in the chest and increase the subjects’ physical capacity as soon as after two weeks of regular usage. Polysaccharides present in the plant exhibit strong anti-inflammatory properties and the ability to reduce cholesterol levels. Clinical tests conducted on rodents have proven that Astragalus prevents the formation of atherosclerotic plaques in blood vessel walls. It also has a very positive effect on the fibrinolytic properties of blood vessel cells, thanks to which it minimises the risk of clogs. It makes it a wonderful preventive agent when it comes to circulatory system diseases. Astragalus exhibits strong hepatoprotective effect; it protects liver parenchyma from damage, also that caused by toxins and alcohol. It slows down the process of cirrhosis development, and thanks to its antiviral properties, it can also prove helpful in treating hepatitis. Astragalus’ adaptogenic properties are invaluable. Used in the case of exhaustion and great stress, it boosts energy, strengthens the organism and makes it more resistant, increasing its tolerance to tough conditions. It is successfully used in China as a substitute for ginseng in people younger than 40, for whom ginseng sometimes turns out too strong a stimulant. Research suggests that Astragalus can supplement therapy of patients with cancer. Supplementation in people during chemo- and radiotherapy has demonstrated that tested patients recuperated faster and lived longer. Those treated with interleukin 2 (IL-2) were more immune to its toxic properties and side effects. Some studies suggest that Astragalus reduces the risk of cancer, whose development is determined by protein p53. 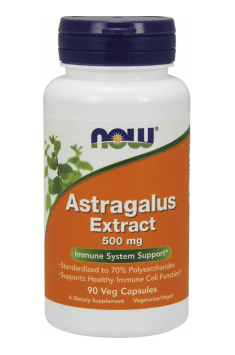 Finally, as a supporting agent for the immune system, astragalus stimulates the organism to fight pathological cells whose growth may lead to cancer. Astragalus Extract is a supplement with a very wide range of healthy properties. It is a perfect choice when you want to strengthen your immune system, thus protecting yourself from various ailments. It can also aid standard treatment in people who suffer from diseases stemming from immune system problems. Because of its anticancer and immunomodulatory properties, it is a standard element of cancer prevention. The extract contained in the product has been well tested, it is not toxic and it bears practically no risk of side effects. Astragalus Extract 500mg 90 caps. The optimal daily dose of this herb supplement is at least 2 capsules a day, taken after meals. The best time to use the supplementation is fall-winter period, when we are most prone to infections and colds. It may be also helpful in the periods of strong overload of the organism, during high-intensity trainings, preparations to competitions or chronic diseases. After a month of application, it is worth taking a one-month break from supplementation. Copper in three perfectly bioavailable forms. Effective deficiency prophylaxis.